First cut a 5 1/2" x 8 1/2" piece of Stampin' Up! 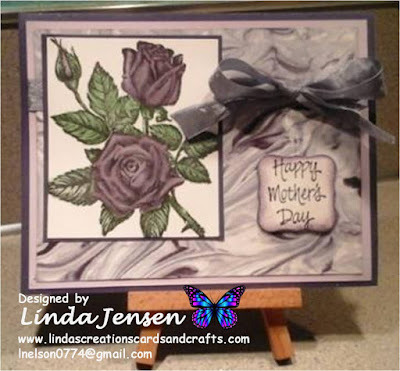 Rose Red card stock and fold it in half for the base, a 4" x 5 1/4" piece of Stampin' Up! Pretty in Pink for the front layer, a 1 3/4" x 4 1/4" piece of Rose Red for the sentiment's background and a 1 1/8" x 4 1/8" piece of Pretty in Pink for the sentiment. Then dry emboss the front layer with a Cuttlebug Butterfly embossing folder and attach it to the base. 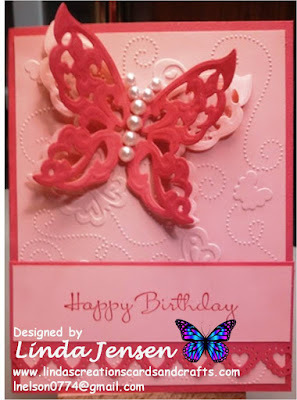 Next cut then emboss the butterflies with a Spellbinders Wings of Hope Shapeabilities die, attach them to each other then to the front layer with mini pop dots and attach the self-adhesive pearls. Then punch the sentiment's background edge with a Martha Stewart Heart Lace Edge punch. Next using a Stamp a ma jig stamp the sentiment with a Stampin' Up! Happiest Birthday Wishes stamp in Rose Red ink, attach it to it's background then to the front layer. Finally, attach the front layer to the base and enjoy!